Lewis was born in Los Alamitos, California. He graduated from Long Beach Polytechnic High School in Long Beach, California, where he played high school football for the Long Beach Poly Jackrabbits. In 2001, he competed in a nationally televised game against De La Salle of Concord, California. As a senior, Lewis was named as a Parade magazine high school All-American and was considered a top prospect by all major recruiting services. Lewis attended UCLA, and played for the UCLA Bruins football team from 2002 to 2005. In 49 games with the Bruins, he started 32 times. He ranks ninth on the school's overall career-record receiving list and first among tight ends with 126 receptions, holding the UCLA tight end all-time records with 1,571 yards receiving and 21 touchdowns. As a senior in 2005, Lewis was a first-team All-Pacific-10 selection, a consensus first-team All-American, and won the John Mackey Award, given annually to the top tight end in college football. Lewis was selected by the Jacksonville Jaguars with the 28th overall pick in the first round of the 2006 NFL Draft. He played college football with running back Maurice Jones-Drew at UCLA who was also selected on the first day by the Jaguars. In July 2006, Lewis signed a five-year, $7.5 million contract that included $4.9 million guaranteed. Lewis initially did not live up to expectations in terms of pass catching ability with 91 receptions through three seasons. However, he impressed coaches with his blocking ability. He was often used as a blocker during the 2008 NFL season due in part to an injured offensive line. Lewis has been active in his hometown community of Long Beach, California. In 2010, Lewis matched the Jaguars single-season touchdown receptions record with a total of 10 and was selected to his first Pro Bowl. He had previously been named as an alternate for the 2009 Pro Bowl. Due in part to the 2011 NFL lockout, the Jaguars placed the franchise tag on Lewis on February 24, 2011. On August 5, 2011 after a short training camp hold out, Lewis signed a five-year contract reportedly worth about $35 million ($17 million guaranteed). On March 9, 2016, Lewis re-signed a three-year, $12 million contract to remain with the Jaguars. He was placed on injured reserve on November 21, 2016 after suffering a calf injury in Week 11. 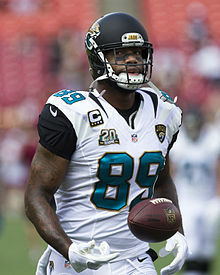 On March 20, 2018, Lewis was released by the Jaguars after 12 seasons with the team. On May 24, 2018, the Green Bay Packers signed Lewis to a one-year, $2.1 million contract that included a $500,000 signing bonus. On November 4, 2018, Lewis caught his first pass as a Packer, which went for 5 yards. He finished the 2018 season with 3 catches for 39 yards. On March 18, 2019, Lewis re-signed with the Packers on another one-year contract. ^ SONDHEIMER, ERIC (December 16, 2008). "A Game Changer" – via LA Times. ^ "Marcedes Lewis – UCLA, TE : 2006 NFL Draft Scout Player Profile". DraftScout.com. Archived from the original on May 25, 2018. Retrieved May 25, 2018. ^ "Meet Marcedes Lewis". OrlandoSentinel.com. October 22, 2016. Retrieved May 25, 2018. ^ Ganguli, Tania (December 28, 2010). "Jaguars Maurice Jones-Drew, Marcedes Lewis and Montell Owens selected to the Pro Bowl". Jacksonville.com. Retrieved February 24, 2011. ^ "Jags franchise tag Marcedes Lewis". ESPN.com. February 24, 2011. Retrieved February 24, 2019. ^ DiRocco, Michael (March 9, 2016). "Jaguars re-sign TE Marcedes Lewis to three-year deal". ESPN.com. Retrieved February 24, 2019. ^ Jackson, Zac (November 21, 2016). "Jaguars place Marcedes Lewis on IR". ProFootballTalk.NBCSports.com. ^ Wesseling, Chris (March 20, 2018). "Marcedes Lewis to be released by Jacksonville Jaguars". NFL.com. ^ Wesseling, Chris (May 24, 2018). "Packers signing former Jaguars TE Marcedes Lewis". NFL.com. Retrieved May 25, 2018. ^ Demovsky, Rob (May 31, 2018). "Breaking down TE Marcedes Lewis' contract". ESPN.com. Retrieved June 1, 2018. ^ "Packers re-sign TE Marcedes Lewis". packers.com. March 18, 2019.